WARNING MACHINE TRANSLATION ORIGINAL PORTUGUESE TEXT WARNING HISTORICAL REPORT Timor-Leste Noticias 26 de Fevereiro de 2016 Lusa Matan Ruak accuses Xanana and Alkatiri of "favour scheme" like Soeharto"
"I regret that relatives and friends of Brother Xanana and Brother Mari have benefited from the state contracts." Fretilin accused President of speaking in Parliament as an "opponent" and the CNRT denounced these "insults without charge"
The Timorese president yesterday compared the benefits that leaders of the country like Xanana Gusmão and Mari Alkatiri have given to "family and friends" with the practices of former Indonesian dictator Suharto in a speech in Parliament. "Since 2013, Xanana Gusmão, Mari Alkatiri and Lu-olo [Francisco Guterres, president of Fretilin] use unanimity for what? They do not use unanimity and understanding to solve all the issues that have to be resolved. privilege, "said Taur Matan Ruak. "Brother Xanana [former prime minister and current minister] is in charge of Timor, Brother Mari [also the former prime minister] is in charge of Oecusse, and I am sad, this virus is spreading. basic democracy is trust. Without it democracy does not work, "stressed Matan Ruak. Speaking to Parliament at a time of political crisis in Timor, Matan Ruak recalled a dialogue earlier this month with Prime Minister Rui Maria de Araújo. "I regret that relatives and friends of Brother Xanana and Brother Mari have benefited from the state contracts. You asked me if I wanted to do an inspection," he said. "I told him no, that I was just talking about the displeasure I felt about the privileges. Matan Ruak was speaking in Parliament's plenary, at a time when East Timor is experiencing a political crisis over the president's decision on the command of Defense Forces (F-FDTL), which did not follow the government's proposal, which renewal of the mandate of Lere Anan Timur. "I do not have a problem with the government, but the government uses Lere's argument to reach out to the president, who remains available to discuss in Parliament to find a solution to the case. my behavior by this principle, "he said. "I do not want a society based on power and privilege. This society, here and elsewhere, has its days counted," he said. Taur Matan Ruak said that Xanana Gusmão and Mari Alkatiri now have a "total complicity" relationship, which is reflected in their respective political forces, CNRT and Fretilin in Parliament. But, he considered, that unanimity did not solve the country's problems. "The state of Timor-Leste is overly centralized, it centralizes competencies, powers and privileges, excessively lavish resources, and creates first- and second-class citizens," he said. In a speech of less than 30 minutes, without a written address, he defended his option to change the command of the Defense forces, but most of the speech was addressed to some political leaders and to the deputies who for several years approved the state budgets by unanimity, accusing them of being "complicit in the waste of the state." "So much money in these projects, and schools, agriculture, health without conditions, Parliament allows this waste." Addressing the population, Taur Matan Ruak welcomed the "serenity" with which they have accompanied this controversy in recent weeks and thanked the military for "behavior". "Keep it that way, Timor needs you like this. 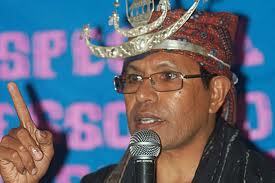 Peace and stability, a strong democracy, are essential for the future of Timor," he said. Reactions to Matan Ruak's words were not long in coming. For Fretilin president the president spoke in Parliament as "the voice of a pure opponent to the government" of Timor-Leste, but without offering alternatives. Lu-olo also accused the head of state of being "the bad guy" and not being able to "draw anything right for Timor." Natalino dos Santos, leader of the largest Timorese party, accused the president of using Parliament to make "insultless insults" on the country's historic leaders and to "campaign."